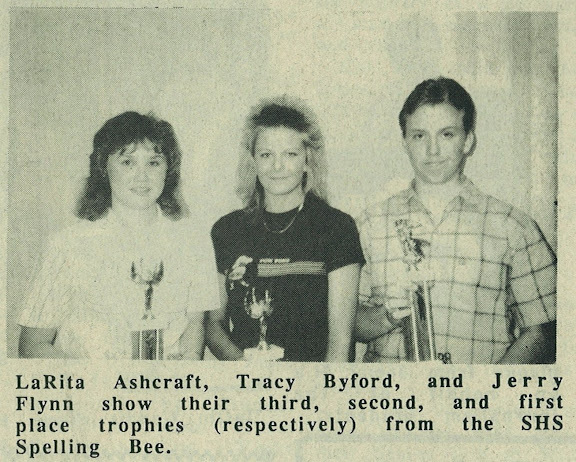 LaRita Ashcraft, Tracy Byford and Jerry Flynn show their third, second, and first place trophies (respectively) from the SHS Spelling Bee. Jerry Flynn won the SHS Spelling Bee held April 21. 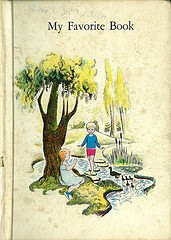 Tracy Byford and LaRita Ashcraft won second and third places, respectively. Each English teacher’s class selected a representative from that class for the spelling bee. 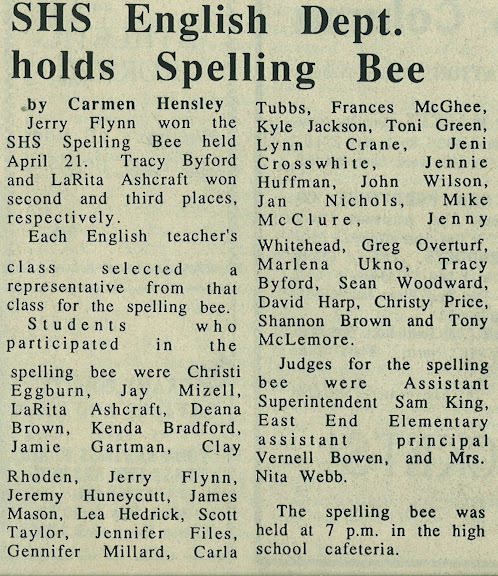 Students who participated in the spelling bee were Christi Eggburn, Jay Mizell, LaRita Ashcraft, Kendra Bradford, Jamie Gartman, Clay Rhoden, Jerry Flynn, Jeremy Huneycutt, James Mason, Lea Hedrick, Scott Taylor, Jennifer Files, Gennifer Millard, Carla Tubbs, Fraces McGhee, Kyle Jackson, Toni Green, Lynn Crane, Jeni Crosswhite, Jennie Huffman, John Wilson, Jan Nichols, Mike McClure, Jenny Whitehead, Greg Overturf, Marlena Ukno, Tracy Byford, Sean Woodward, David Harp, Christy Price, Shannon Brown and Tony McLemore. Judges for the spelling bee were Assistant Superintendent Sam King, East End Elementary Assistant Principal Vernell Brown and Mrs. Nita Webb.The spelling bee was held at 7 p.m. in the high school cafeteria.